Copernicus Sentinel-3B satellite in its rocket ready to go to the launch pad. Image courtesy of ESA–S. Corvaja. The latest Sentinel satellite in the Copernicus programme, 3B, launched on the 25th April from the Plesetsk Cosmodrome in Russia. Lift-off was at 18.57 (BST) and you could have watched the event live on the ESA broadcast. Sentinel-3B is the twin to Sentinel-3A which was launched on the 16th February 2016. It has a launch weight of approximately 1 250 kg and following a flight of just under one and half hours, it should go into a near polar sun-synchronous orbit at an 814 km altitude. Sea and Land Surface Temperature Radiometer (SLSTR) will measure temperatures of both the sea and land, to an accuracy of better than 0.3 K. This instrument has 9 spectral bands with a spatial resolution of 500 m for visible/near-infrared wavelengths and 1 km for the thermal wavelengths; and has swath widths of 1420 km at nadir and 750 km looking backwards. It’s worth noting that two thermal infrared spectral wavebands are optimised for fire detection, providing the fire radiative power measurement. Ocean and Land Colour Instrument (OLCI) has 21 spectral bands (400–1020 nm) focussed on ocean colour and vegetation measurements. All bands have a spatial resolution of 300 m with a swath width of 1270 km. Synthetic Aperture Radar Altimeter (SRAL) which has dual frequency Ku and C bands. It offers 300 m spatial resolution after SAR processing, and is based on the instruments from the CryoSat and Jason missions. Microwave Radiometer (MWR) dual frequency at 23.8 & 36.5 GHz, it is used to derive atmospheric column water vapour measurements for correcting the SRAL instrument. Once in orbit the two satellites will be separated by 140 degrees which will allow them to offer short revisit times – less than two days for the OLCI and less than a day at the equator for the SLSTR. The operational life of the satellite is seven years. 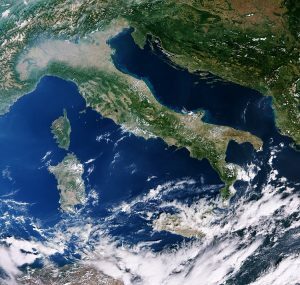 Italy and the Mediterranean captured by Sentinel-3A on the 28 September 2016. Image, courtesy of and, contains modified Copernicus Sentinel data (2016), processed by ESA, CC BY-SA 3.0 IGO. Sentinel-3 is generally considered to be an ocean and coastal monitoring mission and its measurements include sea-surface height, sea surface temperature, ocean colour, surface wind speed, sea ice thickness and ice sheets. In the image to the left, it is interesting to note the sediment in water on the east coast of the Italy, in contrast to the mostly sediment free west coast. As you can see from this image in addition to its primary focus on water, Sentinel-3 also provides measurements over land which includes the heights of rivers and lakes, water quality indicators, land cover change, vegetation indices and monitoring wildfires. This is the seventh satellite in the Copernicus programme launched since 2014, and will complete the trio of twin satellites following the radar imaging Sentinel-1A & 1B and the optical imaging Sentinel 2A & 2B. The seventh satellite the singular Sentinel-5P which measures the atmosphere, although there a number of further Sentinel missions already planned. All the data from these satellites is free to access to anyone with a computer and a decent internet connection. You can download the data yourself, although there are an increasing number of websites online that will do a lot of the basic processing and visualising for you, meaning all you need to do is pick what you want to investigate. This is great for people new to satellite data and it enables them to get involved with Copernicus data without the need for any specialist skills. This programme also offers companies, like Pixalytics, the opportunity to develop a range of products and services based on the data. We already have products using Sentinel-1, and are in the process of developing ones with Sentinel-2 and Sentinel-3. Exciting times in Earth observation! 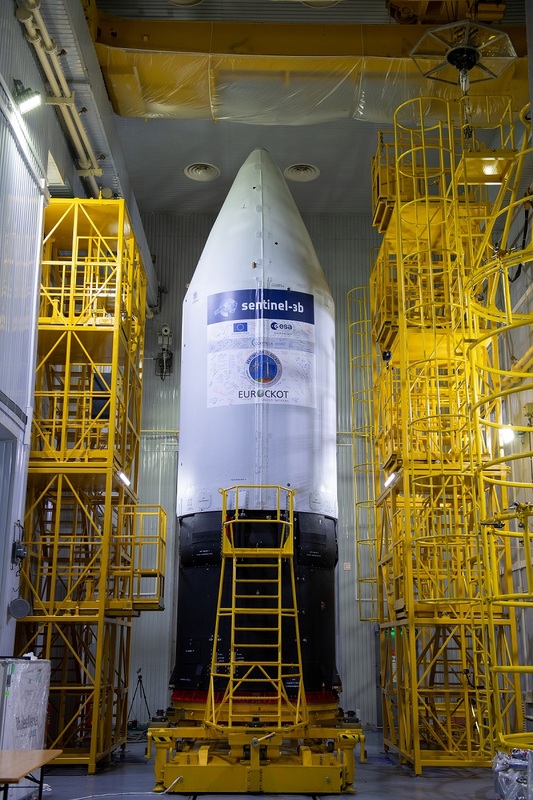 We wish Sentinel-3B well as it sets forth on its journey! This entry was posted in Agriculture, Copernicus, CryoSat-2, Data, Earth Observation, ESA, Olympics, Remote Sensing, Satellite, Sentinel, Space Can Help, Space Industry, Understanding Space, Water Height Altimetry and tagged Copernicus, data, Earth Observation, free-to-access, Ocean and land Colour Instrument, OLCI, pixalytics, Plesetsk Cosmodrome, satellite, Sea and land Surface Temperature Radiometer, Sentinel, Sentinel 3A, Sentinel-1, Sentinel-2, Sentinel-3B, SLSTR, SRAL, Synthetic Aperture Radar Altimeter by Andy. Bookmark the permalink.